Yes, and that’s Carl Palmer on drums. They will b doing “Fire” as part of Carl’s set at each concert. No problems – I did think the instrumentals were good – at least on video. Didn’t I read that he had to keep taking the flaming headdress off because it got so hot? Mad. I love Arthur Brown. Especially “Galactic Zoo Dossier”. What an album! 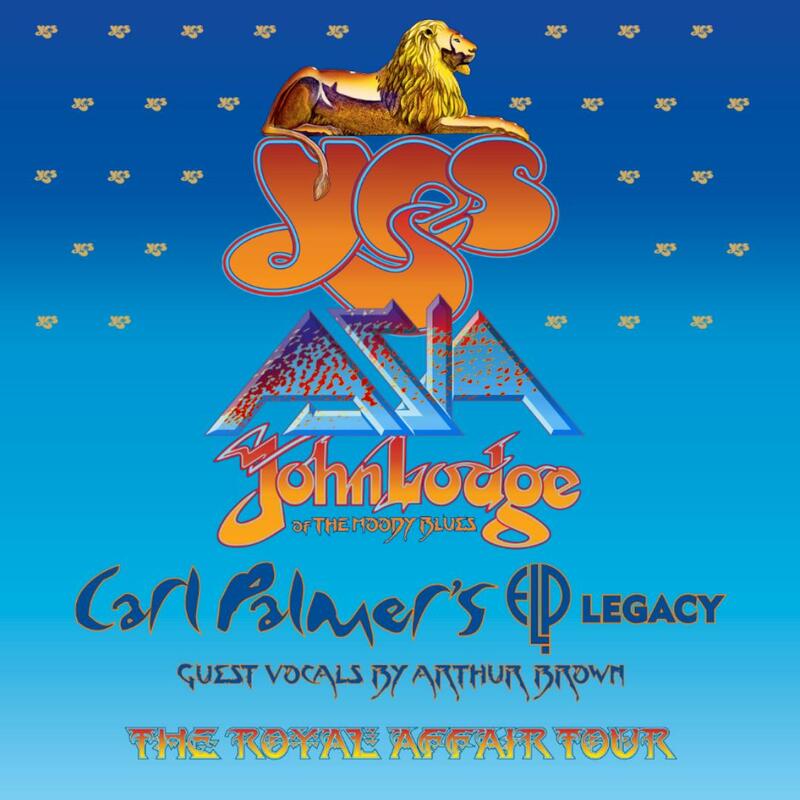 Quite what he brings to the Carl Palmer show in terms of covering Greg Lake’s role I am not as sure – probably perfect for the rockers maybe less so on the choir boy ballads. Given that they were in Crazy World together it makes perfect sense and I am sure “Fire” will get an outing given that it was a huge hit on both sides of the Atlantic. I saw the Carl Palmer trio about 18 months ago and it was a fantastic set and I say that as someone as was never a huge ELP fan. Those two acts together would be more than enough for me. As for the rest I have absolutely no interest in Asia and less still in John Lodge. I actually have no desire to see shows like this in general and hope they don’t bring the same concept back here. Overall this kind of thing is great for people who go to three or four shows a year – like a mini festival. Me, I want the two hour plus immersive experience not a trip down memory lane. Rubbish branding too. “Royal Affair” sounds like a Barbara Cartland novel and I hate the whole idea of music being cast as a “tribute”. One song for Chris Squire in a Yes set is truly poignant. This John Lennon thing is I am sure 100% sincere but I have no idea what it really has to do with Yes. What next, the Steve Howe tribute to Lou Reed with a Progged up version of “Ocean” and Billy, Geoff and Jon doing the doo doo doos on “Walk on the Wild Side”? This concept is only for the US & Canada summer tour. Every other year Yes will do this Yestival. Management just decided to call it Royal Affair instead of Yestival 2019, which was the original plan. Fair enough. I still find it a bit of an odd title. Yes I agree the branding is odd. If this show came to the UK I’d go but mainly for Yes! Ron will be singing lead for Asia. I’ve seen him with Sons of Apollo twice. Great musician & singer. I wonder if Yes will perform “Instant Karma” since Alan White was on that? That’s a very simple arrangement which won’t require much rehearsal at all. “Video Killed the Radio Star” will be performed by Asia. They’ve already done it before. I doubt the new guitarist will add anything to Asia’s usual performance. The guitar melodies are very clearly defined by Howe and guitarists have always played them that way. I don’t know anything about his singing. The festival tour is a bit of a disappointment without Moraz doing Relayer, but I’m sure it will be a fun night anyway. Lodge won’t have much time on stage so I hope he goes straight to his classic-era Moodies material. They are one of my favorite bands and Lodge’s songs are excellent, assuming he can still sing them. Carl Palmer we know will be excellent; he’s one of the top two drummers in prog history. I think it’s strange to bring Athur Brown around on tour; just to sing one song? Does that make any sense when his sole hit is a non-ELP song? I wish Lake could find a singer that could handle Greg Lake’s work, and a keyboardist would be nice too. The plan is for Brown to sing a couple of ELP songs, and “Fire.” It was Carl’s idea, as it’s been 50 years since they did “Fire” together, and have remained friends, and Carl wanted to give Arthur a tour around the US & Canada one more time, and for them to share the 6 weeks together. Carl has repeatedly said he knows he can never have a fulltime singer & keyboardist as the comparisons to ELP would be endless & brutal. He’s doing what he wants, something new & challenging with the music. Replicating the exact same ELP sound is fruitless; wishing for it is a waste of time. Thanks Doug – I was unaware of the Carl connection – good to know! You’ve never seen Ron play or sing, so you have no idea what he will bring to Asia. I have. The man is extremely talented and will add his own touch to the guitar & vocals. The plan is for Lodge & band to have 45-60 mins. His set, which I’ve seen 3 times, is a mix of his solo material & Moodies songs he sang, all nicely done. As of last fall his voice was just fine. Online bootleg videos don’t do justice to most singers. Yes that’s a good suggestion – it would be great to hear some cover versions from band members’ past lives! But it boile down to how excited I am by this, not least because the venue in Rogers, AR is close enough to my house that I can walk or bike ride to it (which I will probably wind up doing). Even nicer, I saw the ARW show in St. Louis a few years ago, so now I get to see a completely different but no doubt equally awesome Yes line-up for a very different experience. I already took the day off, something my boss understood since he’s a big Yes fan and has his own tickets. I have a feeling he’s expecting the ARW line-up though………..
I’m especially excited to see Arthur Brown. Brown rarely seems to get mentioned these days, and his name never comes up when talking about prog – but I’m a huge fan of the keyboard-drenched psychedelia of the first Crazy World of Arthur Brown album. Not only that, but Brown was a near neighbor of mine when I lived in Austin, TX for years, which encouraged me to check out some of his more esoteric later material. Even if it’s just for a few songs, and mostly not his own, I’m really looking forward to see him. Sorry your post went AWOL! Good Arthur Brown connection! I’m really not that familiar with him, apart from the ‘hit’! I should find out more. Hailing from the Philly area myself, I can say that WMMR was THE classic rock station during the 80’s. Even before then they championed great music. For example, they are listed as a broadcast source for the amazing Jersey City 1977ish Yes bootleg from the “Solos” tour. The version of GOD from that show is mindblowing! Thanks for the information, Doug. 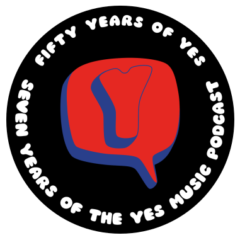 That’s a pretty good claim to Yes fame! Great show guys! I am looking forward to seeing each act on this tour. This should be a fantastic evening of music! I am very excited to hear what Bumblefoot brings to the Asia sound. He is an amazing guitar player and vocalist. 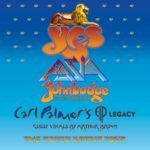 I am grateful for the opportunity to see Carl Palmer’s ELP Legacy. I can’t wait to find out what songs will make up the Yes setlist. Hopefully there will be a few surprises and a few songs from the first 2 albums. Thanks Steve – yes I agree there should be some interesting things in the set lists!